For VICE, I interviewed Chloë Sevigny about Lizzie and talked to Joel McHale and David Wain about A Futile and Stupid Gesture. 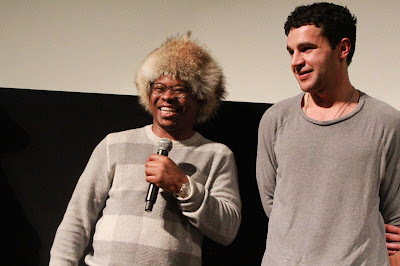 For Uproxx, I interviewed Jason Mitchell about Tyrel - which I also reviewed for The Playlist. And for Flavorwire, I did a preview piece, and then a documentary wrap-up and narrative round-up. Oscar nominations happened! I wrote about them. And a new month began, so here is a streaming guide and an indie preview. Also for Flavorwire, I did some galleries! Here's one for Gallery1988's "Fake Theme Parks" show, and one for their Monty Python show. UT Austin has a great new digital archive of vintage movie posters; here are some highlights. Folio Society has a new edition of A Wrinkle In Time, so here are some illustrations from that. Oh! And! BD/DVD/VOD guides! For 1/23 and 1/30.